SMD1 ChipQuik low temp Alloy for removal of QFPs, PLCCs, SOICs and chip components without complex and costly equipment. A large inventory stock of heater tips and nozzles are not required. See instructions on ease of use. ChipQuik SMD1 Alloy removes SMDs safely and quickly with it's own soldering iron. Low Cost: ChipQuik SMD1 Low Temp Alloy is available in complete kits for field service or industrial packaging for rework departments. No shelf life! No investment required. 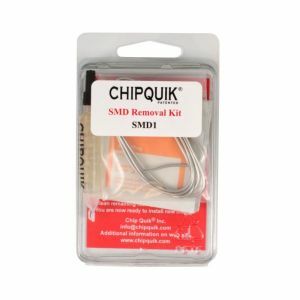 Use ChipQuik SMD1 Alloy with existing rework equipment or temperature controlled soldering irons. 2.5ft ChipQuik Alloy material (removes 8-10 SMD's), 1cc syringe of ChipQuik SMD1 No Clean Rework Paste Flux, Alcohol pads for cleanup and a complete guide on SMD removal and cleanup. 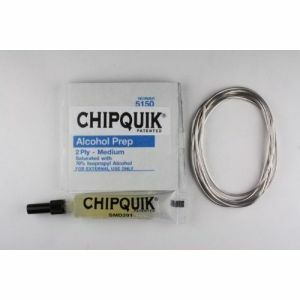 Purchase ChipQuik Low Temp Alloy sold by Howard Electronics Today!